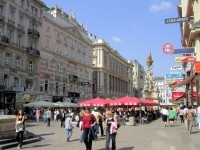 Vienna has turned out to be the most attractive city in Austria for foreign immigrants, in which the proportion of foreigners has reached 23 per cent of the city's population. Figures from a Statistics Austria's report released on Monday showed that the proportion has reached twice of the average rate in Austria. The report showed that around 19,100 new foreign immigrants settled in Vienna in the year 2012, accounting for the 44 per cent net immigration in the country. In the beginning of 2013, 40 per cent of the foreign population in Austria lived in the capital city of Vienna. Domestically, net migration has reached about 43,800 in 2012, an increase of 40 per cent, compared to previous year. Vienna has recorded the most liveable city in the world, thanks to its convenient public service, comfortable climate, and good accommodations, which has led to the rising immigrants’ population.